That bit of beauty within broken cement represented hope, as well as the persistence of nature. That thought stuck with me. Well, at least it stuck in my subconscious. Many years later, I woke up around 3 a.m. and thought, “Huh. That’s interesting.” I pulled out my journal, pen and flashlight (all writers must have these on their night tables, right?) and the words flowed. Green green, fresh and clean. That’s how it began, and an hour or so later, the book was drafted, and I was sound asleep again. When I woke up hours later, I was so happy to see it still there, written, and not just some dim recollection of a dream! And I shook Baldev awake to show him. From there, we talked with each other about community gardening. And about how these gardens have the power to transform lots back into green space, thereby transforming neighborhoods. Most importantly, we talked about how children are the key to shaping how we all feel about nature, and how kids, no matter where they live, can really play a role in transforming our world by making it more GREEN GREEN. From there, Baldev and I worked to identify vital things kids could do right now to help. So, at the end of our picture book, we included simple ways kids can help save the honey bees, and the threatened Monarch butterflies. Simple changes can make a huge difference! My agent, the wonderful Jennifer De Chiara sent the manuscript to editor Susan Dobinick at FSG, who is a huge advocate for community gardening in cities. And she wanted to publish GREEN GREEN! 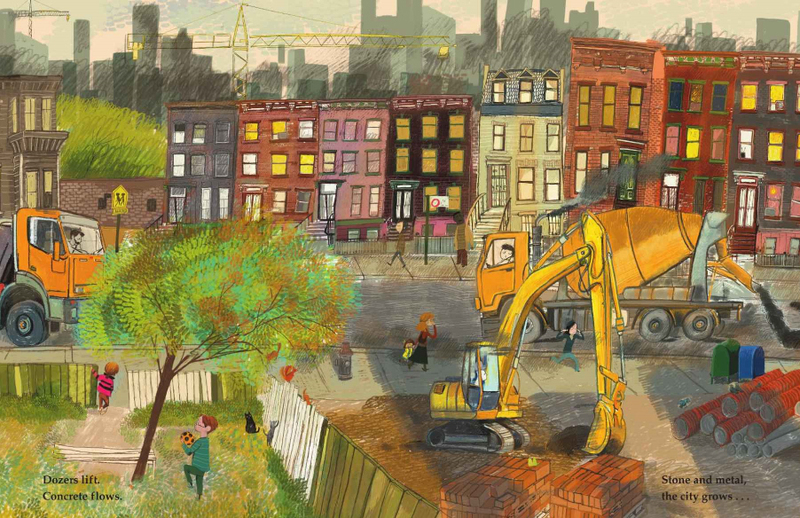 Then illustrator Sonia Sanchez brought this world to life with her vibrant illustrations. When Susan left FSG, Grace Kendall took the reins and guided us with her sharp and caring editorial eye. Within all of these skilled hands, the results were beyond what I could have imagined. Baldev and I have two biracial daughters, so we were especially moved when we saw the book populated with a cast of kids representing so many different backgrounds! 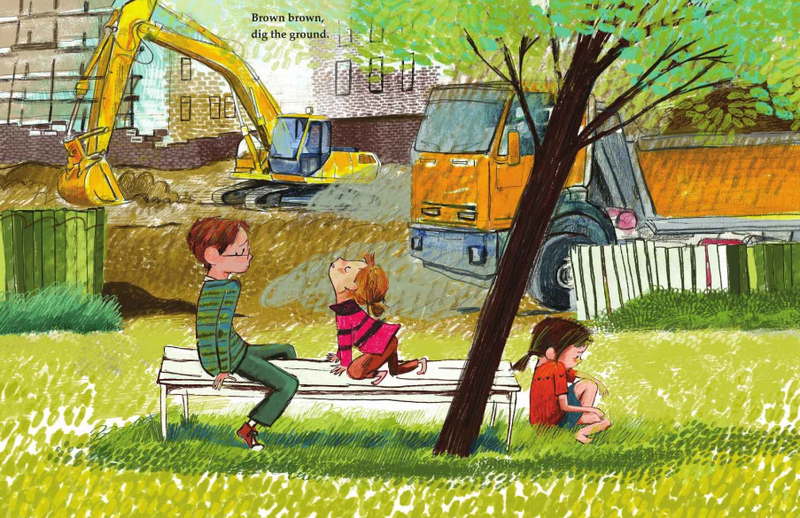 And we have since seen just how powerful these images are for children who read our book. At a recent story time we did at an urban library, one adorable girl called out, “Where’s the brown girl?” She was so eager to see the child on the cover of the book taking action in the story. With delight, we turned the page and pointed. “Here she is!” That character is the one who prompts all the adults to think, hm, maybe we CAN turn this abandoned lot back into something GREEN GREEN again. The look on that girl’s face as we showed her that page meant the world to us both. She saw herself taking action, making a difference, helping the world. That’s what we hope every child reading this book will come away with. And that’s the power of a children’s book. We are humbled to have our small part in shaping the hopes and dreams of any child. Marie Lamba (www.marielamba.com) is author of the humorous young adult novel What I Meant… (Random House), which Publisher’s Weekly dubbed “an impressive debut.” She’s also author of the summery YA novel Over My Head about a girl who has either met the love of her life or a player out to break her heart. Marie’s newest novel is a time travel YA romance titled Drawn, which is about an artist who falls for an attractive medieval ghost with a sketchy past. Her short story “What I Did…” is in the Philadelphia Liars Club anthology Liar Liar (Mendacity Press). 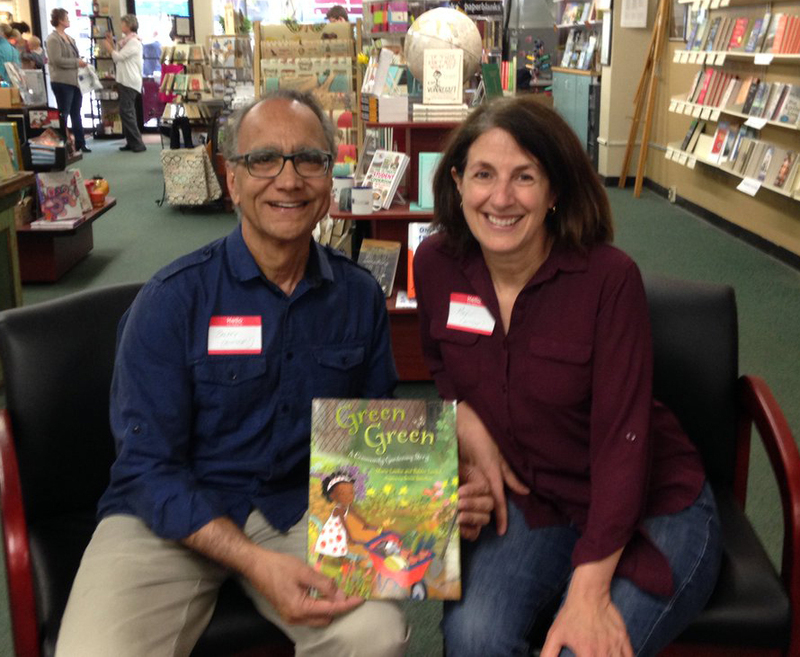 Marie’s debut picture book Green Green (Farrar Straus Giroux), co-authored with her husband, and illustrated by Sonia Sanchez, comes out in 2017. In addition to her fiction, Marie has published numerous articles in national magazines, and her essay “The View from the Outside” is in the anthology Call Me Okaasan: Adventures in Multicultural Mothering (Wyatt-MacKenzie Publishing). She lives in Pennsylvania, is a proud member of the Liars Club, and is a Literary Agent for the Jennifer DeChiara Literary Agency in NYC. Thank you Marie for sharing your book and it’s journey with us. Looks like a winner to me. Love the picture of you and your husband at the book store. I know the winner will be really happy to add it to their library. Beautiful! I can’t wait to add this one to my collection! Wonderful details in these colorful illustrations! Oh my gosh. That’s so moving and inspiring–not just to keep writing but to remember to practice random acts of kindness, to be compassionate…to get out there in the world, in our own little community and get involved! We all have gifts and talents to share. This book is actually good for Thanksgiving, isn’t it? I love the story of how this book came to be an the potential impact it will have on our little ones! Bravo! Hi all! 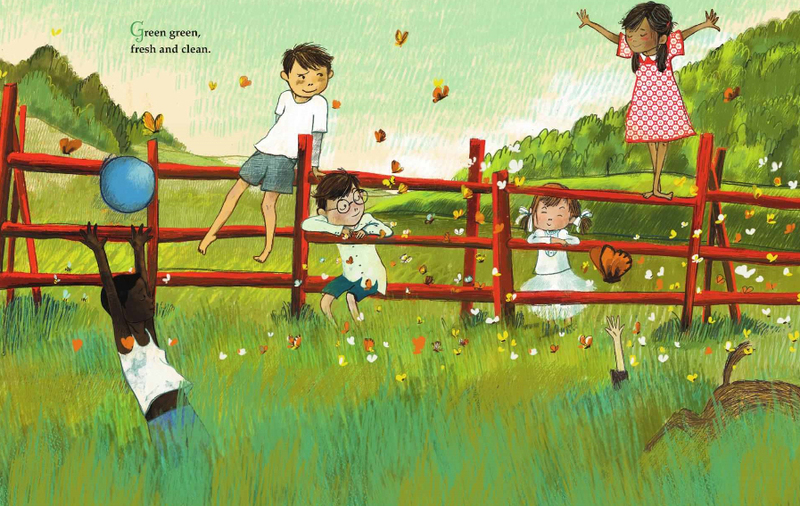 Just in time for gift giving – here’s a giveaway for my picture book GREEN GREEN: A COMMUNITY GARDENING STORY. I’ve also shared how I got the idea for this book (something to do with a crack in the pavement, actually!). Check out Kathy’s Temean’s post here, and comment for a chance to win. A powerful message told so simply and with such an endearing cast of characters. I LOVE it! What a lovely looking book and a great message too. I’d be very pleased to win a copy. I tweeted a link to this post: https://twitter.com/carlrscott/status/933073516907208704, and pinned an image with a link on Pinterest: https://pinterest.com/pin/336573772143690272/. As a retired school principal, if I win, I will make sure this gets into the hands of a teacher who wants to start a community garden and teach kindness to kids! This book is inspiring me, Maria! And Sonia’s art is beautiful. Can’t wait to read it. I love the story behind the story! Thanks for sharing. What a wonderful book! I remember Maria from the New Jersey SCBWI conferences, I believe!